There’s something about a toucan, isn’t there? Toucans tell you that you aren’t in Kansas anymore. They affirm that the tropics are true, not just myths manufactured to make those of us with winter jealous. Thanks to a childhood steeped in sugary cereal, I’ve always had a soft spot for Toucan Sam and his ilk. 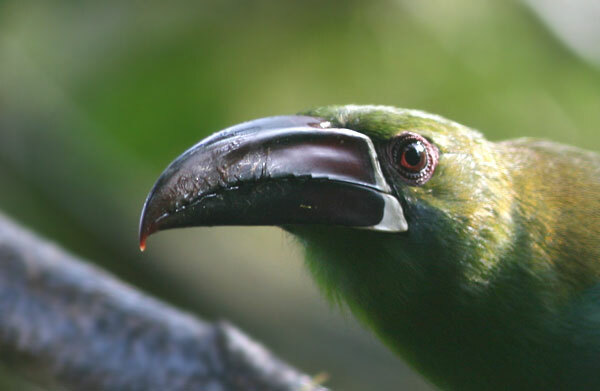 And while I’ve seen a number of different toucan species, every one is a thrill, even the toucanets! Actually, the toucanets I’ve may be even better than the toucans, since some of them have offered better views. The Crimson-rumped Toucanets (Aulacorhynchus haematopygus) I was privileged to observe at Refugio Paz de Las Aves in Ecuador were absolute cripplers, as the parlance goes. Is this a beautiful bird or what? Look at that monstrous bill! 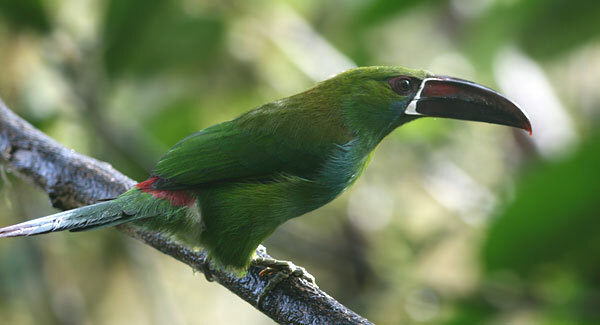 The Crimson-rumped Toucanet is a bird of humid northern Andean forests. 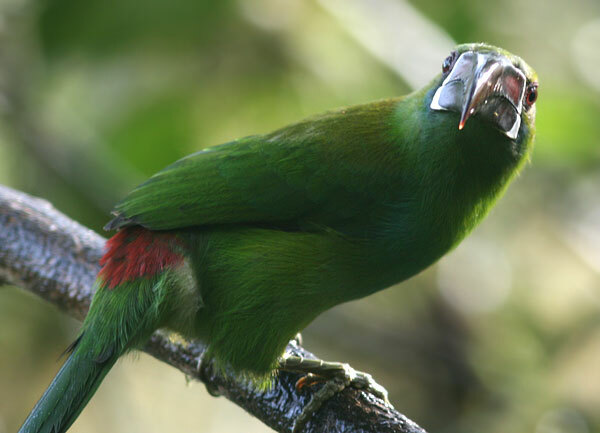 Aulacorhynchus species are considered the green toucanets, which suits this bird pretty well besides its blue-tinged breast and ruby-red rump. 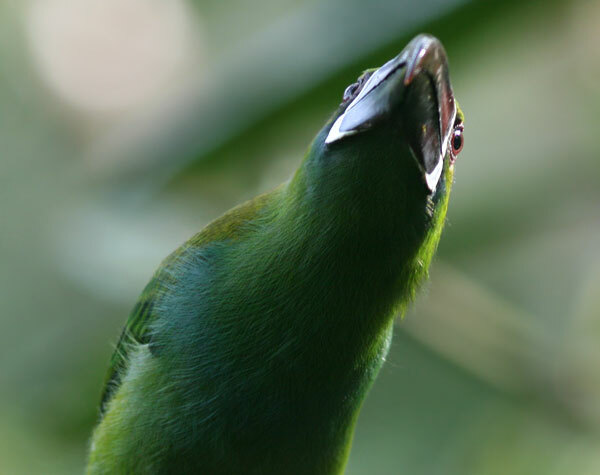 As one might surmise, a toucanet is tinier than a full-fledged toucan. Toucans are birds of legend come to life. 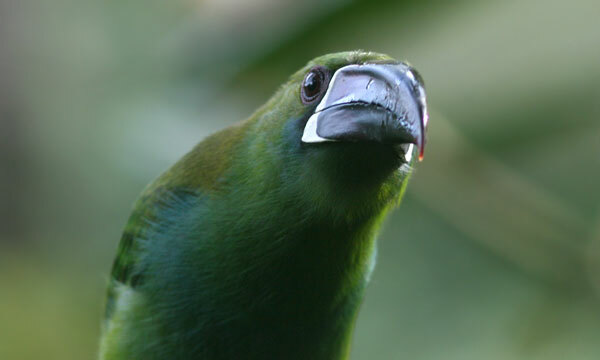 Neotropical specialties like manakins, tanagers, and antpittas may get most of the press but, seriously, what are the tropics without those trusty toucans? This post was originally published on 30 March 2010, but we hate to keep posts this good buried in the archives! Absolutely crippling is right. God, was it trying to eat your camera? Beautiful shots Mike! This bird has a very curious personality and is constantly looking to make sure you stay out of his large bill. I dont´know if Angel Paz will ever be albe to attract the larger toucans but I will keep you posted if he does. Hope you can help. We are building a house on Lake Norman, NC. Yesterday a brown bird landed on the pier railing. It was similar in size to a jay but it was all brown with a beak similar in shape to a Toucan but not as wide (or is it tall?) as a regular Toucan. The beak looked like dark polished teak and the rump when it flew was reddish with brown tail feathers. Is this a Toucan cousin?